Despite some confusing design and spec changes, Sony's latest US-bound effort looks to be a contender in the competitive ring of the most capable smartphones around. That is, if it's affordable. Update: In a strange turn of events, Sony and Verizon have announced that their plans to release the Xperia Z4v have been cancelled. We were looking forward to this one coming out stateside, but we, just like you, will have to wait a little longer for Sony's next smartphone. 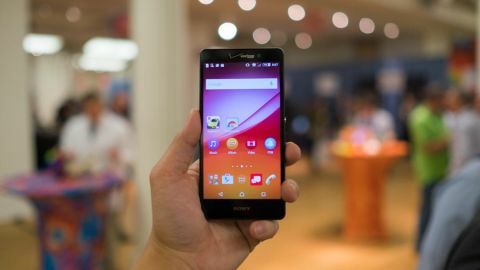 Sony's latest flagship smartphone, the Z4v, is an offshoot of the Xperia Z4 and Xperia Z3+ that's making its way to US shores by way of Verizon Wireless. The new release aims to provide the best traits of each of those phones, while also offering enough aesthetic and internal boosts to trump last year's Xperia Z3v, which was also available through Verizon Wireless. While the build I got my hands on was only a working prototype and didn't feature final software, the presentation was complete enough for me to make some snap judgment calls before its tentative summer release. The Z4v has what it takes to hang with the sharpest and most powerful smartphones available in the US. But if you were hoping for a direct translation of the Xperia Z4 or Z3+, you might be a little disappointed. Sony's line of smartphones rarely receive a massive design overhaul and the new Xperia Z4v is no exception. While it does bring along some minor, appreciated tweaks in its design, the somewhat boxy, yet sleek physique that it's known for remains in full form. Its rounded edges are comprised of matte-textured plastic, smoothed over to make the phone a pleasure to grip and hold. It's not nearly as flashy as the aluminum-detailed Z3+, but it'll do. The camera shutter button, as well as the volume rocker and silver power controls occupy the handset's right edge, as usual. On the left side, one flap covers a slot that you can stuff a nano SIM, as well as a microSD card into. Moving down to the bottom, Sony re-engineered its micro USB charging port so that it no longer needs to be covered by a flap guard during splashy adventures, as it retains the strong IP68 weatherproof properties that protect the rest of phone. Finally, on the top, there's a 3.5mm jack for listening to media through headphones our outputting through a larger, more capable set of speakers. The Z4v measures in at 144 x 72 x 8.6mm (L X W X H) and rocks a lightweight body weighing 160g. Those who have been keeping track of the Xperia Z3+ will notice that the Z4v gained a bit of heft, not just in weight (a 16g increase) but also in terms of thickness, where Sony stuck on almost an extra two millimeters. This might not seem like much, but it's quite a remarkable sizing change-up from recent phones in the Xperia line. The front and back of the Xperia Z4v are each covered in a sheet of tempered glass that looks and feels premium. On the downside, you'd better be in the habit of carrying a cloth with you, as it makes this unit a total fingerprint magnet. The front-facing panel features the signature carved-out spots for the speaker placement on the top and bottom edges. Also similar to the Z3+ is the bezel, which is slim and appealing here. The only other change in front-facing design is the Sony logo, which now appears beneath the screen in favor of a large Verizon logo taking its place on top. Flipping the phone over reveals an equally smooth surface, only obstructed by the new 20.7MP camera, which juts out less than the camera housing on the iPhone 6 and iPhone 6 Plus. The NFC logo occupies its usual space, about a third of the way down the back of the phone. Right beneath it is yet another Verizon logo. The Sony Xperia Z4v we got some time with was black throughout, but will also be available in white upon its Summer release in the US.